This recipe is a Shevenell original, and I’m honored / excited / proud to share it. 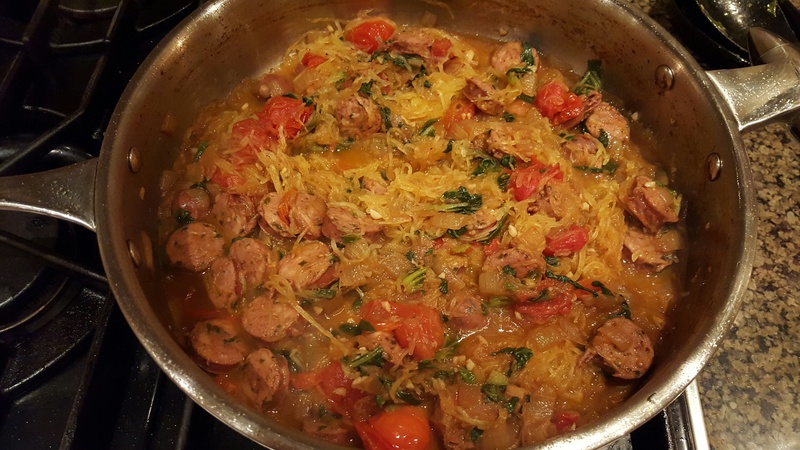 My brother, Ed, is the creative mastermind behind this flavorful blend of veggies, olive oil, butter, and wine, which can be served over pasta or a “noodle” like spaghetti squash or spiralized zucchini. This meal is delicious and good for you – especially if you go the 100% veggie route. Mom and I whipped this up during her visit to Georgia, and it will become a regular in my cooking rotation (get ready, Nick). Ed has a knack for coming up with new recipes and unexpected flavor profiles that taste spectacular, and this is no exception. Heat the olive oil and butter over medium high heat, then add the onions and saute until tender. Add the cherry tomatoes, garlic, balsamic vinegar, and Worcestershire sauce, continuing to cook over medium high heat until the tomatoes blister, burst, and start becoming tender. At this point, add your wine and/or chicken stock and allow ingredients to simmer. We made our sauce with a blend of white wine and chicken stock, approximately 1 1/2 cups total, and it was excellent – the rich qualities of the broth and the acidity of the wine created a nice blend to complement the other flavors. Allow the mixture to simmer while the wine reduces, approximately 10 minutes, then add your noodles, squash, or spiralized zucchini. Continue to simmer for a few minutes, or until squash or zucchini is soft. Ed likes to go with zucchini for the nutty flavor it introduces. You can also easily incorporate meat in this recipe, just vary when you add it depending on cooking requirements. 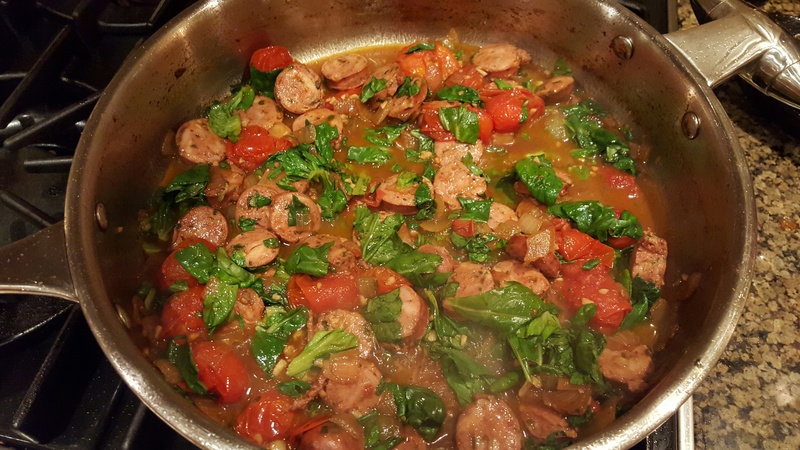 To keep it easy, Mom and I went with cooked Italian chicken sausage, which also made this a heartier dinner. Other good additions would be: cooked chicken, shrimp, or a flaky white fish. 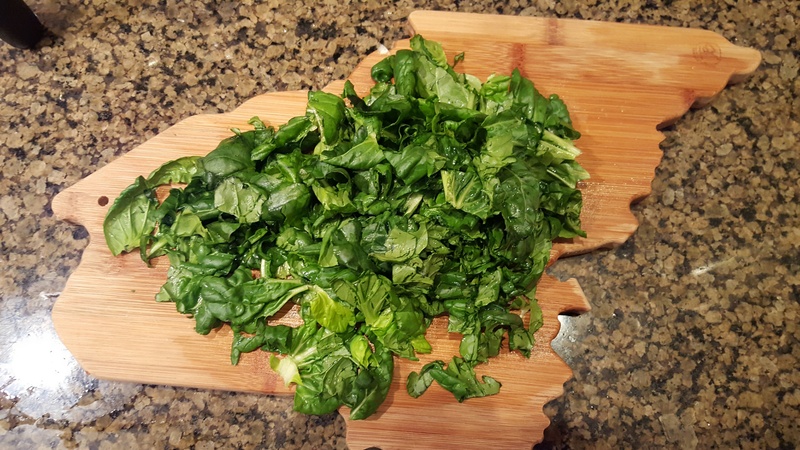 For even more nutrient value, you can toss in some leafy greens like spinach or kale. This is one of those recipes I love because you can stray from it a little bit or vary it to work with the ingredients you have, and it will still deliver delicious results. I hope you try it – and enjoy! Categories: Eat, Weekly Recipe | Tags: family recipe, home cooking, Maine, pasta, recipe, tomato | Permalink.